Mr. Nirenberg strongly believes that an appropriate negotiated settlement almost always is better for the parties than the costs and risks of litigation. With that in mind, he does what he can to help the parties reach a mutually agreed resolution to their employment-related dispute. Mr. Nirenberg considers himself to use a largely evaluative style of mediation. While recognizing that the parties have far greater knowledge about the facts and circumstances of their own cases, he uses his extensive knowledge and experience as an employment litigator to help them evaluate the potential flaws in their positions and to understands not just the potential rewards but also the risks of continuing with litigation. As an experienced employment attorney, Mr. Nirenberg understand the emotional and personal nature on both sides of most employment law disputes. Likewise, he realizes that although money often is the most substantial item being negotiated, it rarely is the only thing at stake. He understands that addressing these non-economic issues can be just as critical to reaching a mutual resolution of a case as agreeing to the amount of the monetary payment. Mr. Nirenberg is mindful that employment law mediations can be effective only when the parties understand each other’s factual and legal positions. This can require limited discovery before mediation can be successful. As a result, he is careful to help the parties determine what, if anything, they need to accomplish prior to mediation to make sure the process has the best possible chance for success. Generally, Mr. Nirenberg discourages joint mediation sessions in employment law cases. In his experience, these sessions are more likely to result in posturing and grandstanding that fosters animosity than to lead to the conciliatory state of mind necessary to settle an emotionally-charged case. Likewise, while certainly not a requirement, Mr. Nirenberg encourages the parties to share their respective position statements with each other before the mediation, while inviting additional confidential submissions from them. 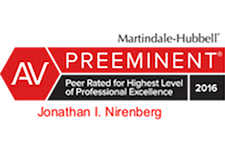 Mr. Nirenberg was selected by Thomson Reuters to be included on its New Jersey Super Lawyers list in 2017 and on the Super Lawyers "Rising Star" list from 2011-2013, and has received an AV Preeminent Peer Review Rating from Martindale Hubble. Information about the methodology for the section is available, respectively, on the Super Lawyers and Martindale-Hubbell website. No aspect of this advertisement has been approved by the New Jersey Supreme Court.